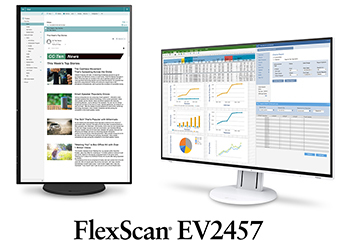 Hakusan, Japan, November 29, 2018 – EIZO Corporation (TSE: 6737) today announced the release of the FlexScan EV2457, a 24.1-inch LCD monitor featuring a frameless and fully-flat stylish cabinet design with DisplayPort daisy chain compatibility for improved work efficiency and style in the office. The FlexScan EV2457 is also compatible with EIZO’s proprietary software Screen InStyle, which lets users control multiple monitors at once, including synced brightness and power settings. An additional feature allows switching of the monitor inputs using user-defined hot keys rather than the switches on the front of the monitor. A server app for Screen InStyle gives an administrator control over the settings of all FlexScan EV2457 units in an installation from a central location. This is especially helpful for enterprises that want to ensure all units are adjusted properly and the power-save settings are activated. The FlexScan EV2457 will begin shipping in December 2018. Date of availability varies by country so contact the EIZO group company or distributor in your country for details. All product names are trademarks or registered trademarks of their respective companies. EIZO, the EIZO logo, and FlexScan are registered trademarks, and Screen InStyle is a trademark of EIZO Corporation in Japan and other countries.